Peaches take me home to the wind swept high desert valley ringed with rocky tops. In that sheltered Colorado valley, Grand Mesa always heralds east, the Monument west and the Book Cliffs north. The Colorado River runs through it and I’m never lost there. Before the current expanse of vineyards claimed the land, peaches were the cash crop bringing in ranchers like gold rush miners. Corporate orchards elsewhere, finicky weather and climate change made peach farming less reliable, but in the 1950’s the entire valley joined in the peach harvest. School openings were delayed, small businesses shuttered, housewives, teenagers and little kids all worked “in the peaches.” It was pocket money for the winter and sometimes a rollicking social festival in the packing sheds. Packers paid by the box, pickers by the strapped on bag, and sorters by the hour, everyone hungered for more work. Waiting for the box-loaded trailer to pull up to the shed, teenagers tossed each other into the irrigation ditch cooling off in the intense summer heat. Through it all our Palisade peaches were the best in the world! I mumbled about peaches from Michigan for years, but now I find them excellent in the market here. The Elberta used to be queen of the crop and I look for the early Red Havens and later varieties with unfamiliar names. With ripening peaches spread across wooden trays, we savor our prized stone fruit. 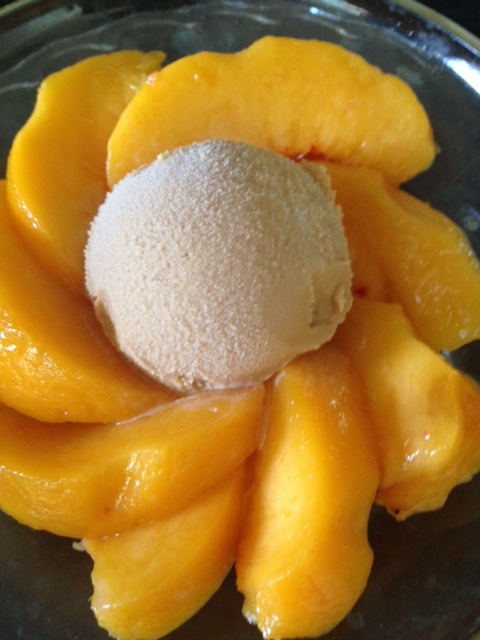 A pie or cobbler would be nice, but ice cream with peaches is always a good choice. Recently I sampled a salted caramel and coffee ice cream at a premium ice cream shop and though the first tastes were shiveringly delicious, soon the confection lost my interest. It was over all too sweet. Excessive sugar has a deadening effect, and at $4.75 for a single scoop, only a few bites were all I could take. Time to create my own version. This formula will make a quart of gorgeous ice cream in a simple home freezer, either electric or hand turned Donvier model. 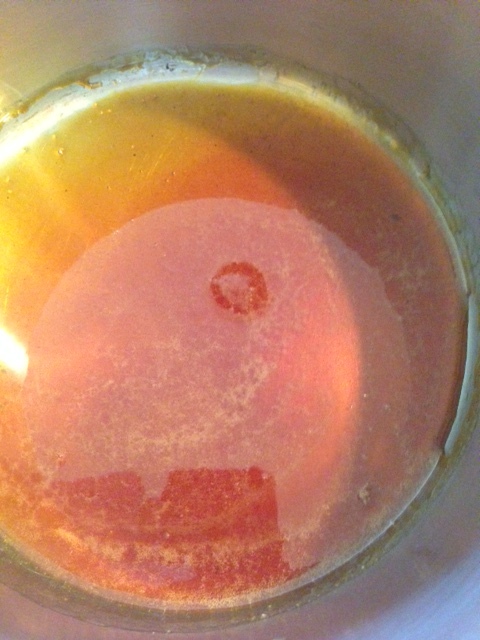 In a heavy saucepan over moderate heat, melt the sugar with salt to a molten amber not quite light coffee color. Do not stir the sugar as it melts, but tilt the pan from side to side to encourage an even melt and color. Slide pan off heat; add 2 tablespoons water, cover then stir to form a thick syrup. Add 4 oz. heavy cream; return to low heat and stir into a smooth caramel sauce. Remove sauce to a bowl. In the same saucepan with caramel bits still clinging, heat the milk to a simmer; add instant coffee and dissolve. Beat 4 egg yolks in a small bowl with 1 tablespoon sugar. Add about ½ cup of the hot milk to egg yolks, whisk to combine and pour the yolk mixture into the simmering milk. Cook, stirring, to form a light custard (when the mixture coats the back of a spoon). Remove from heat; stir in the caramel sauce and cool. Add 8 oz. heavy cream, vanilla and chill. 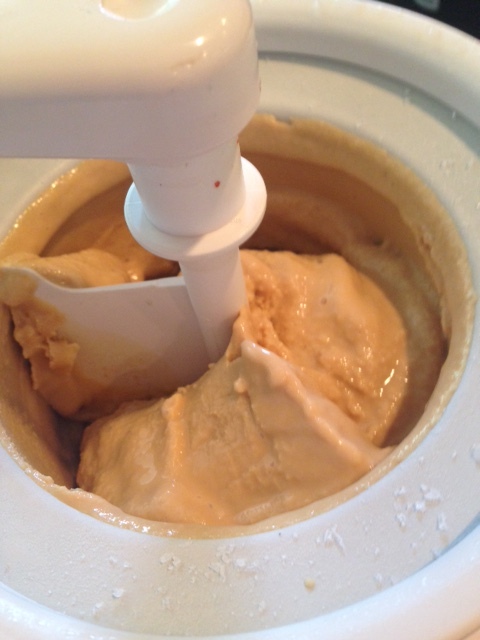 Freeze the chilled caramel/coffee custard in any home ice cream freezer. Makes a generous quart. You are currently browsing the Mary Jo's Kitchen blog archives for September, 2017.